SlNAC4 functions as a stress-responsive transcription factor and might be useful for crop salt and drought tolerance improvement. Abiotic stresses, especially salinity and drought, are major factors that significantly limit crop growth and productivity. Plant-specific NAC transcription factors play crucial roles in various stress responses. However, to date only little information regarding stress-related NAC genes is available in tomato. Previously, we reported that tomato SlNAC4-SlNAC10 genes are involved in response of various abiotic stresses. Expression analysis revealed that SlNAC4 was also induced significantly by MeJA, but not by ABA. To further unravel the function of SlNAC4 in response to abiotic stress, we investigated the effects of salt and drought stress on wild-type and SlNAC4-RNAi transgenic tomato plants. The results demonstrated that the root and shoot growth of RNAi plants was more inhibited by salt stress than that of wild-type at post-germination stage. The leaf salt assay also showed less tolerance in transgenic plants by retaining lower chlorophyll content compared with wild-type plants. In addition, transgenic plants became less tolerant to salt and drought stress in soil, which were demonstrated by lower levels of water and chlorophyll contents, and higher water loss rate in their leaves as compared to wild-type plants under stressed conditions. Notably, the expressions of multiple stress-related genes were downregulated in SlNAC4-RNAi plants under both control and salt-stressed conditions. 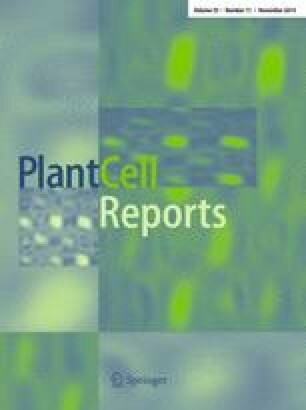 Collectively, these results highlight the important role of SlNAC4 functions as a stress-responsive transcription factor in positive modulation of abiotic stress tolerance through an ABA-independent signaling networks and possibly in response to biotic stress, and may hold promising applications in the engineering of salt- and drought-tolerant tomato. The online version of this article (doi: 10.1007/s00299-014-1662-z) contains supplementary material, which is available to authorized users. This work was supported by National Natural Science Foundation of China (Nos. 30871709, 31100089, 31101546) and the Fundamental Research Funds for the Central Universities (CDJXS10232209).